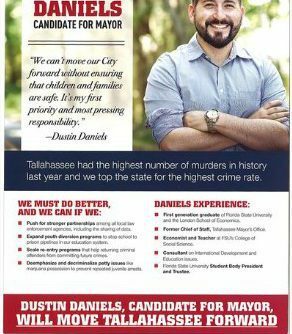 TALLAHASSEE, FL- Tallahassee’s increased murder rate and crime problem have gotten so bad under Andrew Gillum that even his own former chief of staff is campaigning against Gillum’s failure to support law enforcement and prevent violent crime. Image of Dustin Daniels direct mail piece. Andrew Gillum served as a city commissioner from 2003 to 2014 and was elected mayor of Tallahassee in 2014. For more information visit TallahasseeReports.com.